Size: 2131 sq.ft. - 2446 sq.ft. Town Square Dubai brings you a new private community with the collections of several townhouses named Naseem Townhouses. Naseem lies at the entrance of Town Square community, Towns square is a big city of 750 acres that holds 600+ Retail Shops with various range of luxurious apartments & townhouses inspired by Arabic themed architectures. The most sought after destination selling price of 3 Bed homes and for 4 Bed homes starts from AED 1,228,888. Handover date is scheduled in December 2020. Naseem Townhouses fits every type of customers and all the townhouses are carefully designed that you can enjoy everything about it. Villas and townhouses are very much in demand in Dubai. Naseem Townhouses offers you a complete arrangement of big sized homes with different layouts of 3 BR & 4 BR. The sizes of the properties ranging between 2132 Sq.ft to 2242 sq.ft for 3 Bed & 2428 to 2446 sq.ft for 4 Bed. Naseem project is getting strong response from customers that provided you all the services, amenities and facilities you require. Nshama is a Dubai based real-estate firm got established in 2014. Nshama Properties is being led by CEO Fred Durie. The group is operational at Dubai downtown and Arabian ranches with multibillion dollar projects.In the same community the developer has launched various other projects like Rawda apartments, UNA apartments, Hayat Boulevard and so on. Other than residential apartments and townhouses the developers has established Community Parks, Shopping Malls, Educational Institute, Environment-friendly Communities, Restaurants, Health-Centre etc. Their delivered & upcoming project has it all that specifies the lifestyle of modern families. Being a part of 750 acres development (Town Square) all you can see is n number of apartments & townhouses by your surroundings. Town Square is a large developed community was announced by Nshama Group in the year 2015. This community will bring you several phases and has started delivering homes to the end users. In 2016 the developer had launched 3 phases of townhouses & apartments and got executed by 2017. Nshama is mainly focused on to avail 2 & 3 BR homes (Townhouses & apartments). The homes of Town Square City will have dynamic and sustainable features like Educational Institutes, Malls, Retail Stores,Restaurants, Hotels, Cafes, Health Centres and much more. The malls within community will be the ideal option and place for friends and families to shop and socialize. The resident of Naseem, Town Square has access to Dubai Media City, Arabian Ranches, Downtown Dubai, Dubai Mall, DWC Airport, Dubai Marina, Dubai Internet City, Dubai Expo 2020, Burj Khalifa, Dubai International Airport, Burj al Arab and Knowledge Village. These places are at the distance of 25-30 Minutes from the community. 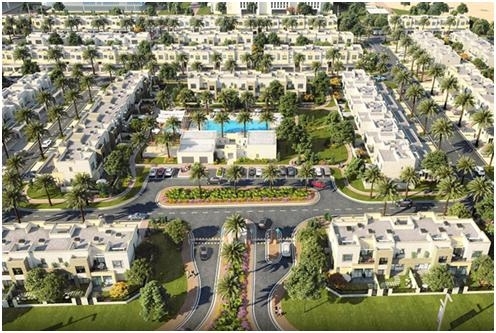 Naseem by Nshama developers to sit upon a city (Townhouses, Villas & Apartments community) @ Mudon's gated community named Town Square, Dubai, UAE. Naseem at Town Square is a comfort living destination with outdoor indoor offerings - Town Square Park, Outdoor Reel Cinemas, Indoor Movie Houses, Ample Parking Spaces,Community Gardens, Sports, Fitness, Football Field, Tennis Court, Biking Trails, Jogging Tracks, Skate Parks, Outdoor Gyms, Swimming Pool, Fire-Fighting, Alarm System and many more. Schools: - Jumeirah English Speaking School, Victory Hights Primary School, Raffles Primary School Arabian Ranches. Hospitals/Health Centres: - Blue Oasis Veterinary Clinic, Saudi German Hospital, Al Zahra Dubai Hospital,Mediclinic – Arabian Ranches, Aster Medical Centre. Shopping Centres: - Al Barsha Mall, Springs Town Centre, JVT Mall, City Centre IMPZ, Dubai Mall. Airports: - DWC Airport and Dubai International Airport. Metro Stations: - Dubai Internet City Metro Station, Sharaf DG Metro Station and Mall of the Emirates Station.